After excellent meals at Shunji and Tsujita, I decided to visit Hide for lunch on the last day of my long weekend in Los Angeles. 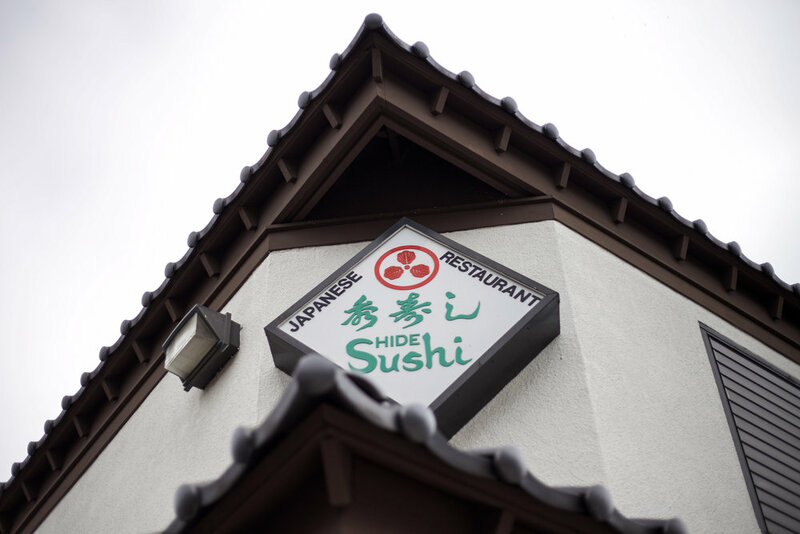 Hide has been in business since 1979, and is one of the longest running sushi shops in the United States. 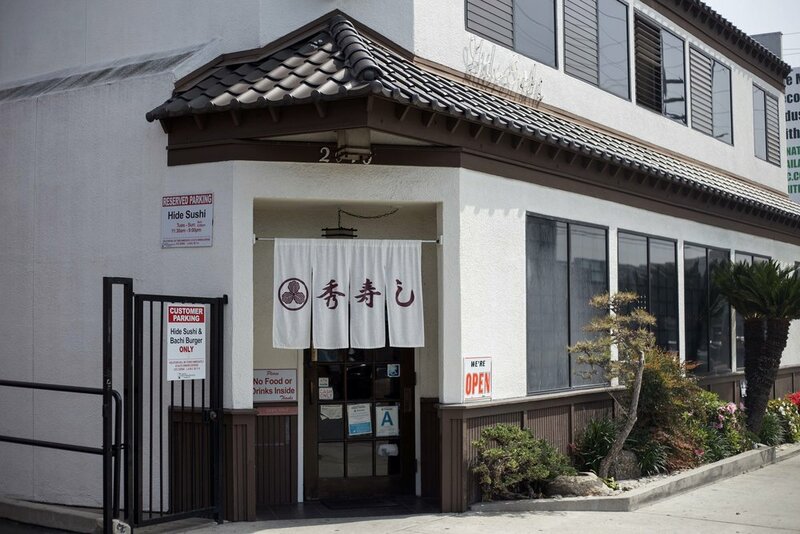 It is known for serving no-frills, quality sushi at low prices, and often appears in LA "best of" lists due to the fact that it is pretty good and very affordable. It's not a fancy place by any means, but has an old school charm and very casual vibe that can be a nice change from the often serious sushi shops. I had visited Hide in the past and found it to serve decent sushi (imagine Tokyo's Sushi Zanmai chain to give you an idea of the level of quality and low prices) and was more than happy to return for a quick, casual omakase session before heading out to LAX to catch my flight home. Sadly, the experience this time around was not good. Things were not off to a great start when the chef hastily plunked down four pieces of nigiri at once, rather than serving each piece individually as is customary. Note that the restaurant was less than a third full at this point, and we were the only customers sitting at our chef's section of the bar, so our itamae was by no means busy. Pictured above: poorly sliced o-toro, and akami. I found the rice to be very bland. Sushi rice has to be both flavorful and complex. Its flavor needs to be able to stand up to the various tane (toppings), and needs to work in balance with the tane. If the rice is not of high quality, cooked correctly, seasoned well and served at the correct temperature, then the sushi won't be good. I found the rice at Hide to be massively underseasoned, and served too cold. Hide uses komezu (rice vinegar) in their shari preparation, but I was barely able to detect any komezu flavor at all. Simply put: if you are eating a piece of nigiri but can barely taste the rice, it is not good sushi. 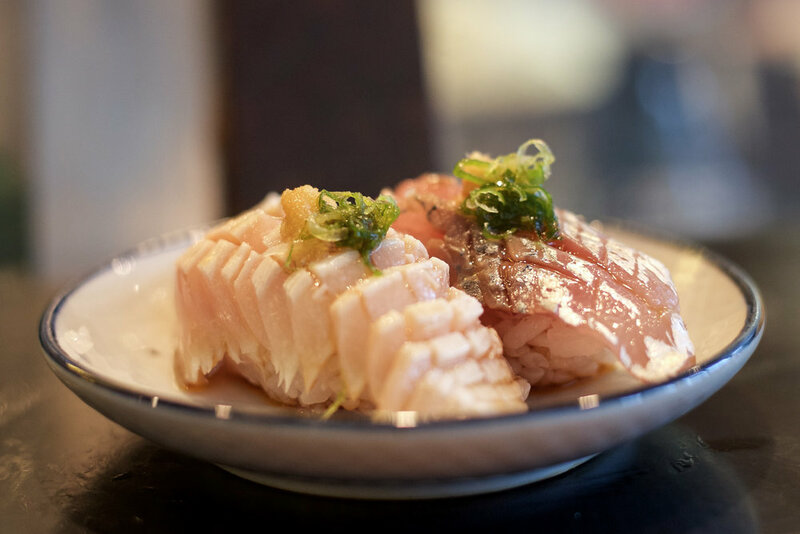 Pictured above: hamachi and salmon served aburi (torched) - a tane and preparation method combination as far removed from Edomaezushi as you can get. I cringe every time I see salmon being served as nigiri as it is never a good sign of things to come. Good Edomae sushi chefs don't typically serve this stuff. Next two pieces: another shiromi (white) fish and aji, placed in a small plate because they were completely drowned in ponzu sauce. Sigh. Followed by rather poorly cut, but fairly tasty negi toro hosomaki. I told the itamae at this point that hikarimono-dane (silver / blue skinned "shiny" fish) were my favorite, and asked if he had any kohada. He did not, and prepared saba nigiri instead. Saba is also one of my favorite tane, but sadly this example was not good. The salting and vinegar marinade was overdone, resulting in an overly salty and sour piece which made the blandness of the rice all the more evident. And the quality of the fish, as I'm sure you can judge from the photo, was below average. Eel was served next, indicating that the omakase was already coming to a close. 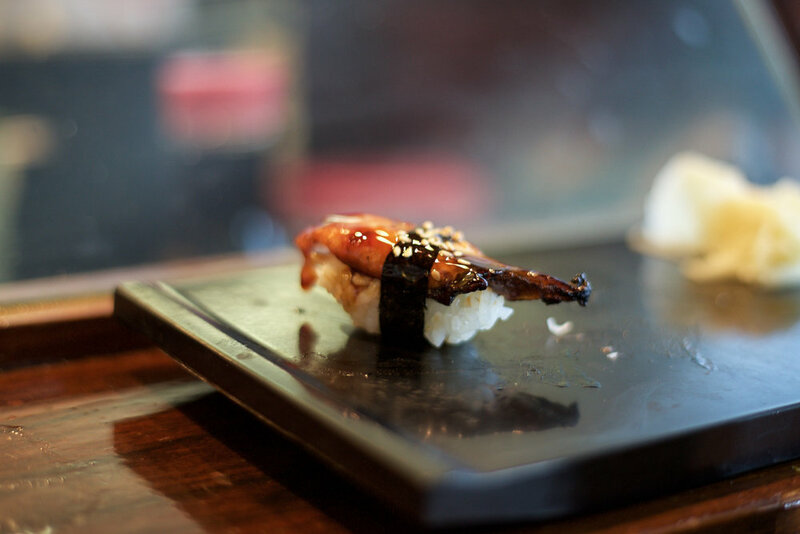 Traditionally, Edomae sushi chefs never serve fresh water fish and for example anago (sea eel) is always served instead of unagi (fresh water eel). But at Hide, we were served, you guessed it... unagi - covered in an overly sweet tsume sauce that tasted suspiciously like a store-bought version. Yuk. Our itamae asked if we wanted anything else. Still being quite hungry, we opted for another piece of o-toro. The fattiness of the fish making up somewhat for the tasteless rice. We also opted to split a kanpyo maki, always a decent and cheap filler when you are still hungry. Overall, I was very disappointed with my meal at Hide. I knew going in that it was a cheaper restaurant than Shunji or Tsujita, and that I would need to calibrate my expectations accordingly, but even with low expectations I came away disappointed. I found the raw ingredients to be of overall poor quality, the rice preparation severely lacking, and the nigiri execution sloppy. There is no doubt in my mind that the quality of the food served at Hide has gone down since my last visit about a year ago. With the number of very good sushiya in the area, including the outstanding Tsujita less than a block away, there is simply no reason to come here.